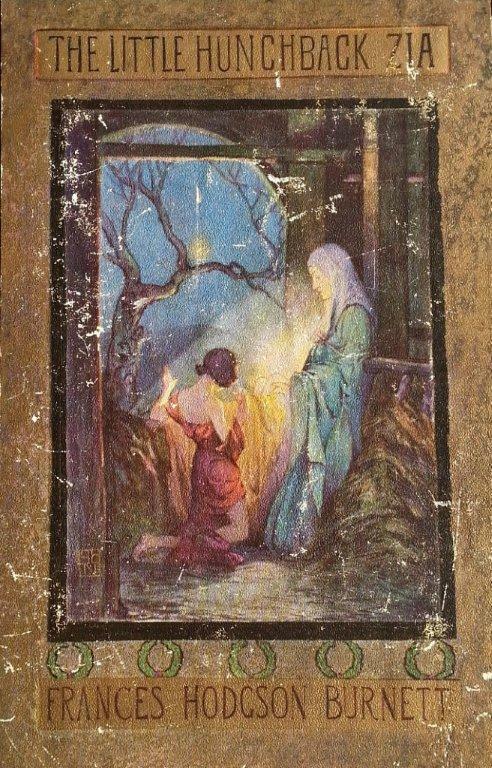 This begins Frances Hodgson Burnett’s little book published in 1916 about a rejected, deformed orphan boy who is sent to beg for the cruel woman who keeps him. 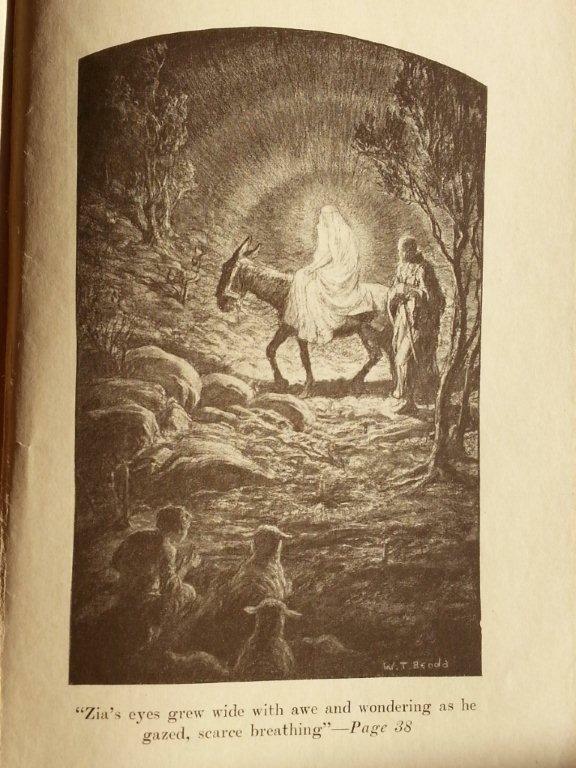 One day, hiding in the brush near the road to Bethlehem, he watches a surprising number of families and animals pass by on the road, playful and happy. But Zia falls asleep sobbing in unbearable loneliness. Yet in the night Zia awakens smiling, feeling an unexplainable calm, without and within. Soon he sees one part of the sky growing lighter, and the sheep nearby suddenly attentive. In the darkness, a weary man walks slowly up the road, leading a donkey which carries a woman. A radiance surrounds her. Although he thinks he is dreaming, Zia nevertheless feels compelled to follow them. And as the crippled and diseased boy climbs the steep hill toward Bethlehem, he does not waver or stumble. Whatever had led Zia to Bethlehem now leads him to find the radiant woman and her husband in the mangers of the cave. 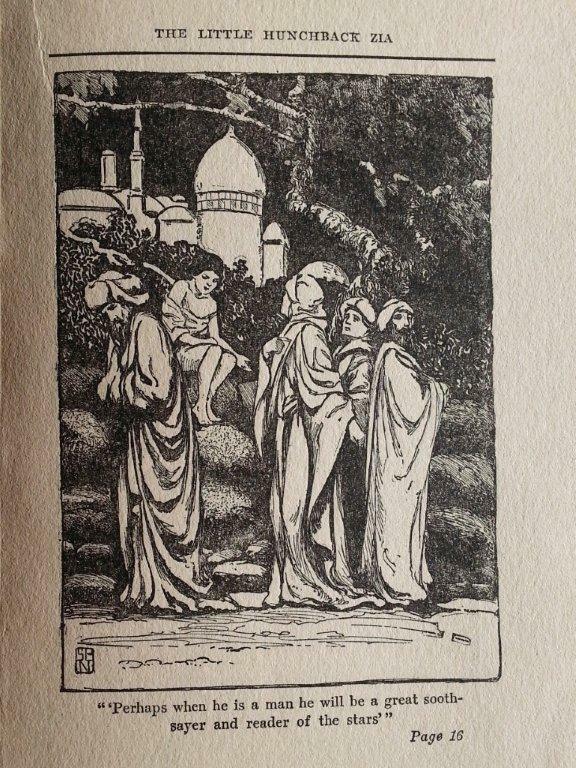 The woman invites him to come near to the new born baby. Zia obeys. He bows his head to the Holy child and feels the feather light touch of his tiny fingers. Soon Zia is healthy and standing upright for the first time in his life. Frances Hodgson Burnett, the well-known author of The Secret Garden, Little Lord Fauntleroy, and many other books, writes in a way that immediately engages and grips her reader. 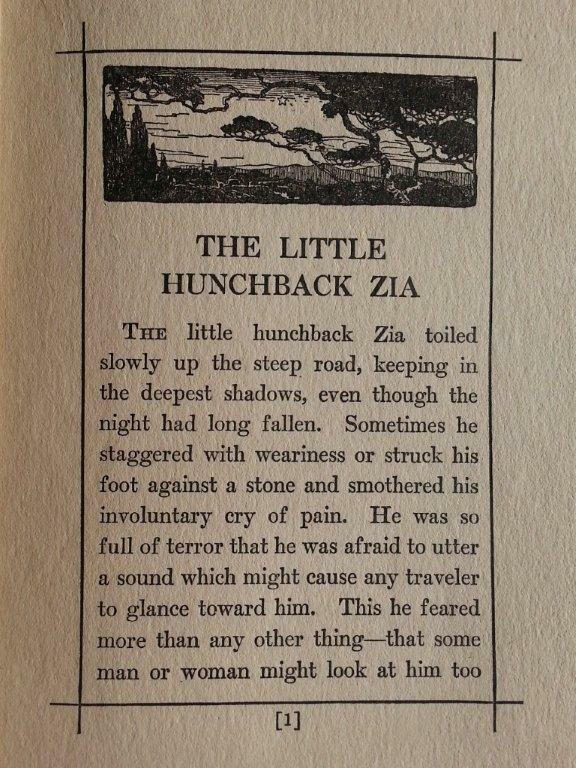 Every page of this little book seemed to draw me deeper into Zia’s experiences and emotions. Even though the story is based on the well-known events in the Bible, and the ending is predictable, every compassionate word of this beautiful story is precious. 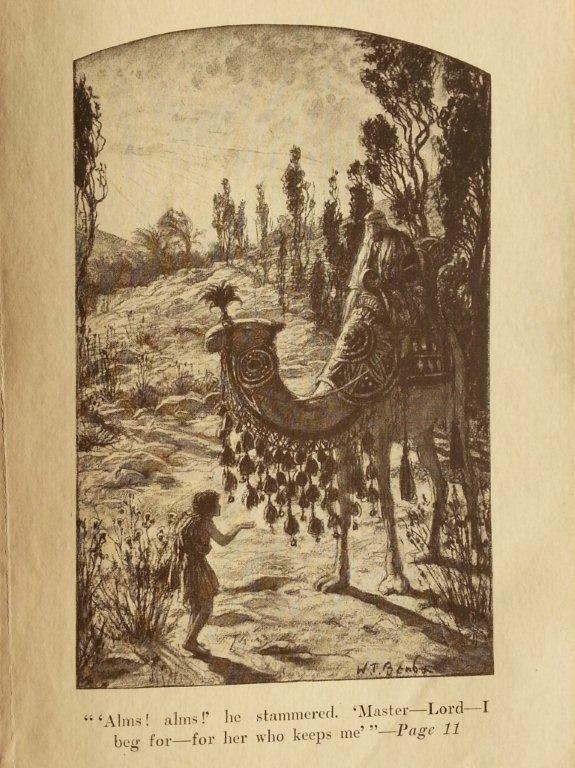 The intricately drawn illustrations were done by Spencer Baird Nichols and W.T. Benda. 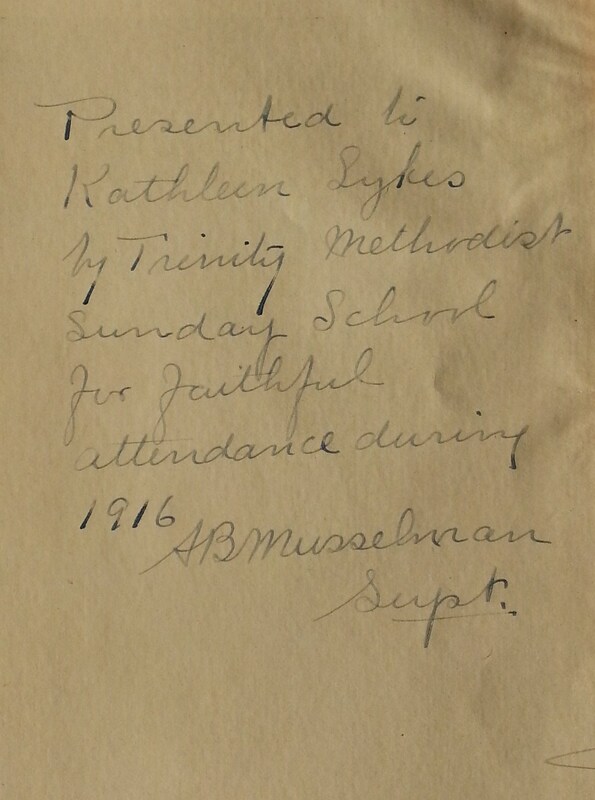 I always love it when a book has a beautifully hand-written presentation in the front pages, and this brand-new book was a gift to a Sunday School student for faithful attendance during 1916. You can buy a printed copy of this sweet book on Amazon, read the Kindle version for free on Amazon, and various versions for free on www.gutenberg.org, www.childrenslibrary.org, and http://www.online-literature.com/burnett/3042/ . Interesting, I wasn’t aware of this title by Burnett. Hi Marcia, same here. I thought I knew all of her writings. This small unknown little book has such magnificent powerful writing!